Become your team's expert on escaping callback hell. Imagine writing your entire Express API or React app with for loops and if statements. No more deeply nested callbacks or convoluted promise chains. With async/await, you can make that dream a reality. Why React and Express don't support async/await out of the box, and how to work around these frameworks' limitations. How to evaluate whether your favorite npm modules support async/await. How promises work under the hood, in excruciating detail, by building a Promises/A+ compliant promise library from scratch. Why async/await is the perfect complement to promises, rather than an alternative. How to use async/await to handle errors and keep nasty red error messages out of your Chrome console. Why async/await works perfectly with for loops and if statements, but not functional constructs like forEach. How to avoid common async/await mistakes, like using return in a try/catch. Valeri Karpov is the lead maintainer of Mongoose. He's a core contributor to Mocha, Agenda, and other npm modules with over 10M combined monthly downloads. He's the author of The 80/20 Guide to ES2015 Generators and Professional AngularJS. His blog is the top result on Google for "async await design patterns". Have an issue? Report it on GitHub and we'll respond within 24 hours . Not happy with your purchase? Report an issue on the PayPal Resolution Center or email val@karpov.io with your PayPal transaction id for a full refund within 72 hours. The 80/20 Guide to ES2015 Generators. I feel like it's Christmas. Thanks @code_barbarian, can't wait to start reading. Just bought the "Mastering async/await" book from @code_barbarian. Thank you Valeri for putting this together! 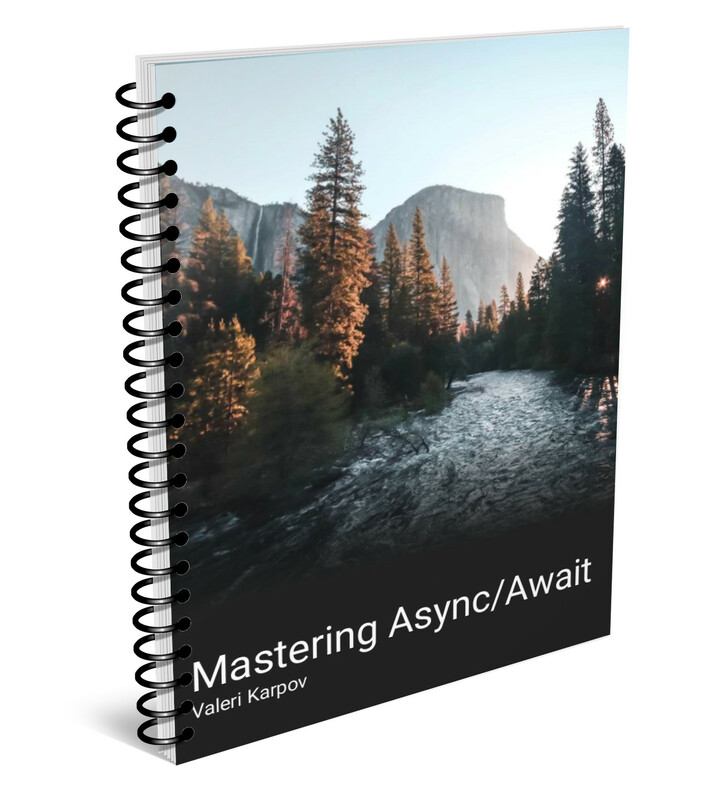 From the maintainer of my favorite @MongoDB library @mongoosejs, comes a new book giving a deep dive on learning and understanding Async/Await, one of the best new features of es6.